Artificial intelligence is commonly touted for its potential to change technology, the workplace, and society at large. But as deep learning, data science, and other technical advances bring certain aspects of AI closer to reality, some of its deepest impacts could come in the world of science. Today, AI already outperforms humans on specific tasks critical for scientific research, such as detecting small signals in immense noise or understanding complex, high-dimensional systems. Researchers already use forms of AI for drug discovery and the design of new materials, but hope to someday thread it through every level of science, from understanding the cosmic secrets of dark matter to more accurate medical diagnoses. In late January, several dozen scientists from UChicago, Argonne National Laboratory, Fermilab, and the Toyota Technological Institute at Chicago gathered at John Crerar Library to discuss how to best use these new techniques to fuel discovery, and how to seed the future of AI for science. 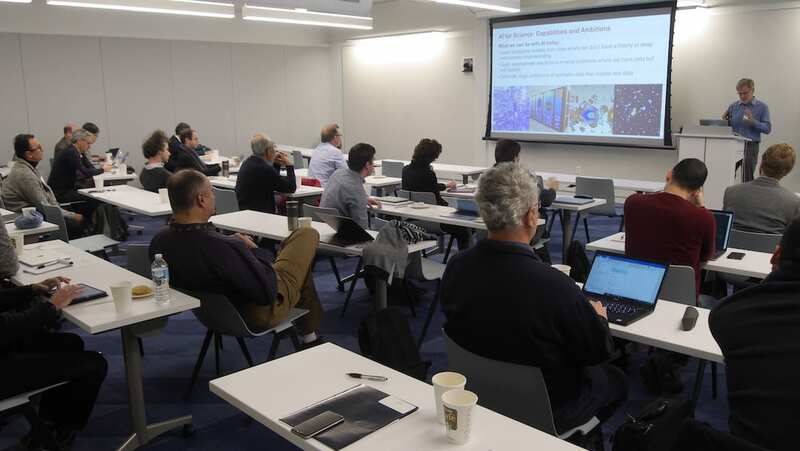 The event, organized by the UChicago Office of Research and National Laboratories and the Center for Data and Computing, was intended to establish new collaborations and reduce barriers between the attending institutions on projects that benefit both AI and domain science. While previous partnerships used AI experts as “consultants” for science problems or science data as fodder for independent AI research, workshop organizer Rebecca Willett argued for a more deeply entangled future. In that spirit, speakers at the workshop largely focused on the future, presenting visions of how the science at their institutions could benefit from creating and embedding new AI approaches. Brian Nord, an associate scientist at Fermilab, highlighted several large physics and astronomy projects, such as DUNE, the Large Synoptic Survey Telescope, and the experiments at the CERN Large Hadron Collider, that would benefit from AI assistance. Many of these projects look for exceedingly rare or small events in massive amounts of data, Nord said, and AI can help both find those targets and automatically control instruments to increase their collection — “auto-tuning” accelerators and telescopes, to borrow a musical term. At fellow national laboratory Argonne, the exploration of AI applications for science goes back several decades, said Ian Foster, Director of Argonne’s Data Science and Learning Division and Professor of Computer Science at UChicago. From an automated reasoning group founded in 1984 to today’s focus on data-driven discovery, Argonne researchers studying energy, materials science, cancer, and other areas increasingly use AI to connect the traditional scientific pillars of theory, experimentation, and computation. “In the future, we hope to develop methods that can learn from both theory and data, automate and accelerate discovery, and expand our ability to use computation to search for new theories,” Foster said. Work presented by Gregory Shakhnarovich from the Toyota Technological Institute of Chicago (an independent computer science institute affiliated with UChicago CS) demonstrated how far AI has come — and how much more is left to achieve — in the specific area of computer vision. Now that deep learning techniques have made tasks such as facial recognition and the broad classification of images (“is it a dog or a cat?”) almost routine, researchers are moving into more complex challenges, such as comprehending the context of entire scenes or automatically writing descriptive text captions for images. Achieving these milestones could make important strides towards a frequently-mentioned need in AI for science — explainable AI, or XAI, where the “black box” of most modern machine learning systems is replaced by human-readable logic for how and why the system made its decision. Such capabilities will be particularly important for public-facing AI applications, such as medical diagnosis, to establish trust among experts using AI decision-making and the people it affects. “It makes me feel more relaxed about computers taking over the world,” Shakhnarovich said. In addition to XAI, a panel and breakout groups discussed other priorities of AI for science, including physics-aware AI, representation learning, how to best combine simulation and experimental data with AI, and specially built AI systems for science. 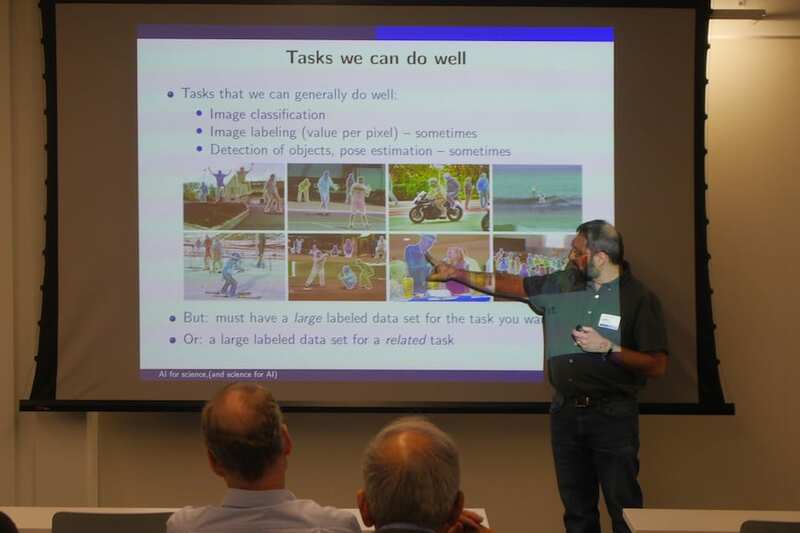 The idea of using AI to guide experimental design garnered particular interest, as workshop participants hoped for AI “assistants” that don’t just help answer questions, but propose which questions to ask in the first place based on past data and publications. With history and expertise across both the theoretical and computational foundations of AI and the large and cutting-edge scientific challenges that can put new approaches to extreme tests, Chicago has the potential to be at the core of AI and science’s interwoven future.